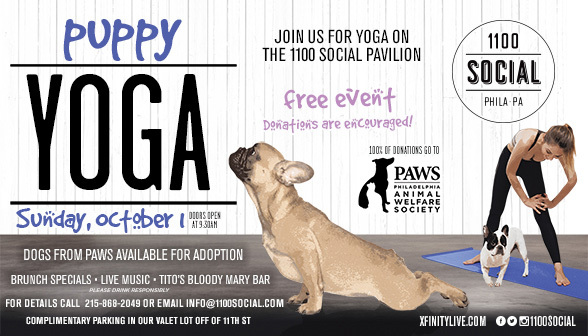 This Sunday, September 17th, and Sunday, October 1st, there will be two free yoga classes held at 1100 Social at Xfinity Live. The yoga class will be an hour long and like the title says, there will be dogs involved. At 9:30am the doors will open and at 10am the event will start. There will be dogs from the Pennsylvania SPCA in September and there will be dogs from PAWS in October. Both events will be benefiting the two non-profit organizations. Donations are appreciated and the dogs will also be available for adoption for both events. After the class is over, everyone who participated will be receiving one complimentary beverage. There will also be brunch, live music, and specials. The address of the class is 1100 Pattison Avenue. Free parking is available at Xfinity live Valet Lot. PAWS is Philadlephia’s largest rescue partner. The organization takes in thousands of unwanted, abandonded, and homeless animals. Their goal is reducing the number of animals who are unwanted and/or abandoned and left for dead. The Pennsylvania SPCA is the state’s oldest and most comprehensive animal welfare organization. They take in animals who have been through abuse and neglect. Both organizations make sure these animals find new, loving homes. More details about the event can be found on PAWS site.